This week I caught up with Chris Lewis, patient activist extraordinaire. Over a decade ago Chris was diagnosed with stage4 Mantle Cell Lymphoma (a rare blood cancer) and given six months to live. Aggressive chemotherapy followed plus a stem-cell transplant from an unrelated donor via the Anthony Nolan charity. The next few years was a rollercoaster of hospital stays as Chris battled medical complications. He saw first-hand how disjointed the cancer support sector is and so he started to address the issues he found most concerning through his blog – Chris’s Cancer Community. This has become the most popular cancer blog in the UK and Chris is frequently invited to speak around the world about his experiences. Most recently, he has set up simPal, a unique charity that gives free phones and sim cards to anyone affected by cancer. This is Chris’s social media story. Hi Chris, I’d like to start off by asking you to tell us something about the role that social media plays in your work. CL: I am the founder of Chris’s Cancer Community and Co- Founder of SimPal, the only charity in the world providing free mobiles and pre-paid simcards for people affected by cancer. None of this would have been possible without social media. My work is known across the globe and I do several international speaking trips every year. I am now the most influential cancer patient in the UK. When did you start using social media – what prompted you to get started? CL: My illness started in 2007, and I had absolutely no knowledge of social media. My health was unreliable and I was in and out of hospital. I began to see how poor support was for people living with cancer and wanted to know if it was only me who felt like that. I have a business background and started asking around. Friends of mine created a very simple blog to start with. My ‘community’ started to grow, my work was winning awards, and the rest as they say is history. It’s wonderful to see how far you’ve come since those earliest beginnings. You now have a presence on several platforms, which is your favourite? CL: No competition here, it is Twitter! I use Facebook and Instagram too but Twitter works best for me. Short and sharp engagement is key. I have a reasonable following which is continually growing. Although cancer is a big part of what I do, I like to mix things up a bit and speak on current issues, whatever they might be. Also my big love of football! I have been using social media for more than 7 years now, and wherever I am speaking in the world, there are people in the room who follow me, and that is a nice feeling! Which topics hold your interest the most on social media? CL: I am particularly interested in the subject of ‘patient engagement’ As a business guy I was shocked when entering the cancer sector, how little effort was put into this. It seems it was mostly box ticking. We are customers of the system, in whichever country you live. Rarely do we have and serious role in designing systems and tools to help us. I don’t know any business that does not talk to its ‘customers.’ Surely they are the most important part of your work? I used to do many twitter chats but as my work has exploded I have so little time to get involved. I find I must limit myself on social media or the entire day can be gone before you know it! Do you have any advice for others who are just starting out with social media? CL: Firstly establish what you want to achieve on social media! Many people are purely there because they feel they have to be. Ask yourself what does success look like for you? Most people are on there to ‘sell’ something, be it a product or a service, but just like in real life it is how it is done is the real key. Unless you listen and engage with others they won’t with you. Remember to listen more and speak less, that way you will learn quickly. Finally, we all started with no followers!! Oh that’s so true Chris! So, I like to end these interviews by asking for a favorite quote. Do you have one you’d like to share with us now? I think kindness is my number one attribute in a human being. I’ll put it before any of the other things like courage or bravery of generosity or anything else. Kindness—that simple word. To be kind, it covers everything to my mind. If you’re kind that’s it. We sure could do with more kindness in the world – thank you for the reminder Chris! And thank you for taking the time to share your social media story with us. If you’d like to learn more about the global work that Chris is doing you can find more information at Chris’s Cancer Community and SimPal. This post is part of an ongoing conversation that explores how patients, healthcare professionals, and researchers use social media to communicate their work. For more interviews, click here. It’s my great pleasure to shine the first social spotlight of the year on this week’s guest interviewee. Terri Coutee is the Founder and Director of DiepCFoundation.org, a nonprofit organization providing education and resources to empower women and men with information to make an informed decision about options for breast reconstruction after mastectomy. After a second breast cancer diagnosis and her own successful breast reconstruction, she writes about her experience in a blog, DiepCJourney.com. Terri is a guest speaker and a strong proponent of the shared decision-making process for patients. When traveling for advocacy, she interviews surgeons, healthcare providers, and patients on topics related to breast cancer and breast reconstruction as another resource to empower those in need of education to find their own voice in their healthcare journey. I’ve known and admired Terri for several years through our interactions on social media. She is a real force for good through her online patient advocacy and a ray of sunshine with her positive motivational style. And now here is Terri’s social media story. Hi Terri, I’d like to start off by asking you to tell us something about the role that social media plays in your work. TC: My platform as a patient advocate for breast reconstruction evolved from using social media. I utilize Twitter, Facebook, Instagram, LinkedIn, Pinterest, and Google Plus to reach a global audience for various purposes. Twitter is my go-to for connecting with the breast cancer and breast reconstruction community. I search for the latest studies and news to share with those who may not be using Twitter. One of my favorite projects is to report from medical conferences I attend. The global community becomes more of a family when you meet your Twitter pals at conferences. The energy and ideas are limitless. I frequently receive direct messages on Twitter asking for specific resources, so it has served me well. You sure do know how to make full use of so many platforms. When did you start using social media – what prompted you to get started? TC: Oddly enough, using social media started for me in an entirely different way than what I am doing now. At the time of my second breast cancer diagnosis I was in graduate school to get my M.Ed. in Teacher Leadership. I set up a Twitter account using an anonymous name, so I could be one of those “lurk and learn” social media people. I used the handle, @6state, because I taught schools in six different states. I knew very little about any social media platforms and had no idea the power of social media at the time. Unbeknownst to me, having successful DIEP flap breast reconstruction after a double mastectomy would be the catalyst for starting a blog about my experience utilizing social media to share my story. I suppose I have nostalgically stuck with the handle @6state. Once an educator, always an educator. One of the things I love most about these interviews is getting to learn something new about people I’ve known online for a while. I never knew what prompted you to use @6state as your Twitter name – that’s s a fun fact for me to learn. I probably interact most with you through Twitter, but I know you’re very active on Facebook. How do you like to use Facebook in your work? TC: Facebook has been a place of support and solace for a growing number of members in a closed group I set up: https://www.facebook.com/groups/diepcjourney/about/. Women and men who are currently in treatment or planning extensive surgery don’t always have the time or inclination to leave their home to attend a support group meeting. The Facebook group is a safe haven for many. It is another way of connecting globally. We have members from all over the world. Additionally, we are honored to have medical professionals including surgeons, physical therapists, radiologists, and support resources like tattoo artists who are welcome and lend great value to the group. The resource I provide through these professionals is priceless. I feel very strongly it brings great credibility to the site. The emotional, positive support the members bring to the group is what inspires me daily. I have found great value in setting up a separate Facebook account for the nonprofit group I founded in 2016, DiepCFoundation. It keeps my followers informed of the Foundation’s activities, outreach, and pertinent topics related to breast reconstruction, including my blogs. Facebook live is another great way to share topics related to breast reconstruction. Viewers can watch, re-watch, and share the broadcasts with others in their own community. One I am most proud was a presentation I made this year. It was recorded at the national medical conference of the American Society of Plastic Surgeons on a topic I focus on in my work as a patient advocate, shared-decision making. You really are rocking Facebook! Let me take you back to Twitter for a moment. Do you take part in any health-related Twitter chats? TC: I have been a host on #TweetChats providing information for breast reconstruction. They are fast and furious but preplanning your comments and hashtags makes them far more effective. I participated in a #bcsm Tweet with The American Society of Plastic Surgeons and one of their board-certified plastic surgeons. Living Beyond Breast Cancer invited me to a tweet chat with my own plastic surgeon and others in the breast reconstruction community to coincide with National Breast Reconstruction Awareness Day in October. Social media obviously plays a vital role in your advocacy work so what advice would you give to others who are just starting out with social media? TC: Take it slow and don’t be overwhelmed by the wealth of information before you or the speed things seem to travel at with constant changes in social media. As I always say, take it one bite at a time!!! Educate yourself about all social media platforms. They each serve a different audience and purpose. Give them all a go! Surround yourself with a tribe who will support and believe you are serious about your message. Read articles and attend seminars to improve your skills. Know you will make mistakes, receive critique, but also get euphorically hooked on a tool that shares a wealth of valuable information to the world and in particular your viewing audience, your true purpose for using social media! Such great advice Terri. I love your enthusiastic embrace of social media and your championing of the creation of an online tribe. So, I like to end these interviews by asking for a favorite quote. I know you are a big fan of inspiring quotes and I always appreciate you sharing them on social media. Do you have one you’d like to share with us now? Thanks so much Terri for taking the time to share the many ways in which you are making a difference using social media. If you’d like to learn more about the work that Terri is doing in raising awareness of DIEP flap breast reconstruction, you can find more information at DiepCFoundation. This week my social spotlight is shining brightly on rare disease patient advocate Ross McCreery. Ross is the founder of CRPS (Complex Regional Pain Syndrome) Awareness Day in the Province of Saskatchewan, Canada. This is an initiative designed to educate and raise awareness for CRPS, a rare autoimmune disease which Ross was diagnosed with in 2006. His diagnosis of CRPS was followed a few years later by a secondary diagnosis of Osteoarthritis. Ross is also involved in initiatives with the Rare Disease Foundation to help establish Peer2Peer support. He is a tireless advocate for research and treatments that he hopes will one day lead towards a cure. Hi Ross, I’d like to start off by asking you to tell us something about the role that social media plays in your work. RMC: For the last thirteen years I have lived with and advocated for the rare disease CRPS (Complex Regional Pain Syndrome). For those of us living with this disease, there are very few treatments, no cure, and very few resources. It is known as the most painful chronic pain condition there is, and some people refer to it as the suicide disease. The basis of the work I do is to try and educate and raise awareness for this disease. The scope of my work is extensive from working with other patients and researchers to the healthcare system and government. I was successful three years ago in lobbying our government in creating a CRPS Awareness Day here in the Province of Saskatchewan. I am also involved in various online projects the main being my blog called Painfully Optomistic which I started as a way to support, teach, and raise awareness for CRPS. And I work with organizations such as iPain Foundation ( NERVEmber ), Clara Health (BreakthroughCrew), WEGO Health (Patient Leader), and Color The World Orange to take part in numerous online initiatives that they run. RMC: I started using social media within the first two years of my diagnosis for two reasons. One was because I live in a Province that has very little support for those of us diagnosed with CRPS. No physician in my city could diagnose me, and I went through two incredibly difficult years finally getting diagnosed in another province. It was really the whole experience of how I had to be diagnosed and everything I went through that caused me to create my blog Painfully Optomistic. I didn’t want others to have to go through all of that, so the purpose of this site was to try and be a support at the same time as trying to educate others on what I already knew about the disease. The other reason I started online though was because I needed a community around me that I didn’t have that at the time. Getting involved in communities on Twitter, Facebook, and through my blog gave me that. I now have a network of not only patient/advocates but friends who I can rely on for support and to ask questions when I need to. I think that feeling of isolation, particularly when you are a rare disease patient, and the desire to be part of a community who really “gets you” is a big motivator in many patients and advocates turning to social media. You’ve mentioned your blog along with Twitter and Facebook communities as key resources for you. Which of these is your preferred platform to communicate on? RMC: The platform that I seem to use the most is Twitter. Although I am using Facebook more and more as I become more involved in my advocacy work. I tend to use the Facebook Live aspect of the platform the most. These platforms allow me the opportunity to come together with other patients/advocates, medicals professionals, and caregivers to grow and learn from one another. This kind of peer-to-peer learning is a vital part of online advocacy. How about health-related twitter chats? Are there any regular chats you take part in? RMC: I participate in regular chats such as #wegohealthchat, #PatientsHavePower, #patientchat, #CreakyChats, and sometimes #hcdlr on Twitter. All of these chats allow me to be a more effective and empowered patient leader through learning from a variety of perspectives. I can stay informed on new treatment options, clinical trials, or even how to work with medical professionals as part of working towards a common goal which is to find treatments and cures. It isn’t really about being interested in just one thing but what can I learn from these different patient/advocates, professionals, caregivers, or whoever it might be. It’s about “how can I change things within myself and the work that I do to better help others including myself”. RMC: The advice that I would have for someone starting with social media is to really think about what your needs when it comes to social media. Start by using the form of social media that is going to best serve your needs. The social media world is huge and we don’t always need every platform that is available to us. Ask yourself why you are using that platform? Are you using it just because everyone else is? Or does it really serve a purpose for what I really need it for? Streamline and make sure that you are using that platform effectively and that your message isn’t getting lost. I really like this advice Ross. It’s easy to feel as if we need to be everywhere at once to make an impact, but knowing where to be to make maximum impact is more important. So, I like to end these interviews by asking for a favorite quote. Do you have one you’d like to share with us? What a great quote! Thanks so much Ross for taking the time to share the many ways in which you are making a difference using social media. If you’d like to learn more about the work that Ross is doing in raising awareness of CRPS, you can follow him @Rossco006 and check out his blog, Painfully Optomistic. This week it’s my great pleasure to chat with Pat Rich, an Ottawa-based medical writer, editor and content curator. I first met Pat online several years ago on the #hcsmca (no longer active) Twitter chat. I was captivated by his insightful and intelligent contribution to this and other weekly healthcare chats. Since then, I’ve had the delight of meeting Pat in real life, most recently at HIMSS Europe this year, where he was reporting live from the conference. Despite, in his own words, becoming grey in beard and long in tooth, Pat maintains a keen interest and presence on social media, especially Twitter. I’d like to start off by asking you to tell us something about the role that social media plays in your work. PR: I spend a few hours daily on social media, usually Twitter, and have done so for the last several years. In addition to my responsibilities in helping manage the Twitter and LinkedIn accounts and blog for Ontario’s health quality agency – Health Quality Ontario – and acting as social media correspondent for the Journal of Cutaneous Medicine and Surgery (Canada’s dermatology journal) I maintain an active role in live tweeting and blogging from my personal accounts (@pat_health) and Days of Past Futures and in curating health information. I have also served as a social media ambassador for digital health conferences in Europe, Canada and the US. I continue to lecture, when asked, on the professional use of social media by physicians and other health care professionals. PR: I started using social media about a decade ago to help the Canadian Medical Association (who I worked for at the time) decide how to use the platforms most strategically. It was a natural evolution from my role in managing content on their website. In this role I was able to help the CMA develop the first balanced social media guidelines for Canadian physicians. I was also prompted to become more actively involved in Twitter through my participation with the #hcsmca community and the excellent work of Colleen Young. You were quite the early adopter Pat. I always think of Twitter when I think of your social media activity. Is this your favorite platform? Are there any others you enjoy using? PR: I am all about Twitter. I find this is the platform that fits me best and I hope it remains a viable communications medium until I retire. Through Twitter I have met the most wonderful people from around the world – patients, physicians and many others. However, I still enjoy exploring other social media as well as writing extensively for print. Through my work with Health Quality Ontario I have recently hosted and provided all technical support for a podcast Quality Matters – which has been quite a learning experience. I first met you on the #hcsmca Twitter chat. Are there any other chats you take part in? PR: I am a huge fan of #healthxph, #hcldr, and #Irishmed – which I consider to be the triumvirate of surviving, regular, health oriented tweetchats for health care professionals and patient advocates. I have been lucky enough to meet the hosts of all of these chats personally and strongly admire their commitment and dedication to these volunteer efforts. I love that you are such a loyal long-term supporter of these chats. The vibrancy and sustainability of this medium is driven by the dedication of the organizers for sure, but also the ongoing support of participants. You’ve been using social media for a considerable time now – what advice would you give to others who are just starting out with social media? I think this is great advice Pat even for those of us who are seasoned social media users. And it’s important that we acknowledge the darker side of social media. Much as it pains me to admit it, there is an uglier side to things online, and we need to protect ourselves as much as we can from malign actors. PR: I have been hugely influenced by the Australian health quality expert Dr. Jeffrey Braithwaite who recently wrote that: “Healthcare is a complex adaptive system, meaning that the system’s performance and behaviour changes over time and cannot be completely understood by simply knowing about the individual components.” This has huge implications for those who think they can change health care systems by implementing reforms from above as things just aren’t that easy. You’ve certainly given us something to think about there Pat. In fact, you always give me something to think about when I interact with you. For those readers who wish to become more informed on global healthcare topics, I highly recommend you get on over to Twitter and follow Pat @pat_health. I promise you’ll be wiser for it. Thanks for taking the time to share these thoughts with us Pat. Wishing you continued success in all that you do. This week I am delighted to interview Isabel Jordan, a founding member and Chair of the Rare Disease Foundation. Under her leadership, the organization has built partnerships between families and researchers through their Research Micro-Grant Program. Isabel is the mother of a young man living with a rare disease and has drawn on her post-secondary degree in biology to become a strong advocate for patient partnership in research. I am a huge admirer of the work you do in forging closer links between clinical researchers and patients and their families, Isabel. Can you tell us some more about the role that social media plays in your work? IJ: What a great question. I feel like everything I do right now uses social media because I’m fully myself on social media. The project that I feel has used social media the best and where I’ve learned the most has been the #ItDoesntHaveToHurt project with Dr. Christine Chambers. I talk about this one a lot because she and I met on Twitter – and in fact, she found a lot of her collaborators online. And the point of the whole project was to use social media to get the best evidence-based paediatric pain information directly to parents and families. What information, you may ask? Well, the subjects were chosen based on the input from the parent panel she recruited – I was a part of that panel. While I had been using social media for a long time, I felt like this project used so many platforms – Twitter, Facebook, Instagram to really engage different people where they are. I felt like a real collaborator, not a token. So you’re a long-time user of social media but can you remember back to the time when you realized that it could be much more than just a way to keep up with family and friends? IJ: Like most people, I started using Facebook to connect with family and friends far away. But the real magic moment came for me on Twitter. I signed on to it because I had the feeling it could be important for my foundation, the Rare Disease Foundation, but wasn’t sure what to do with it. I started off anonymous because I didn’t really understand the nature of the platform or what I could do with it. But what got exciting for me was when I began to realize that there were whole communities of people out there that I could connect with. There were parts of me that were feeling really isolated – the part of me that couldn’t work any more as my caregiving duties for a child with a rare disease prevented that, the part of me that lived in a small town and wanted to connect with a greater rare disease community, and of course, the part of me that wanted to find other nerdy adults to enjoy and share all of our science and science-fiction fun online. When I started to thank other people for posting things that I found useful, helpful, funny, uplifting, suddenly, conversations started happening. Suddenly, strangers became acquaintances became friends. Is Twitter your favorite social media platform or are there others you enjoy using? IJ: Definitely Twitter although I also enjoy Instagram as well. I love taking photos and love art and seeing a visual insight into other people’s worlds is enriching. I find Facebook off-putting a bit, although some community spaces within Facebook have been very really helpful in navigating specific rare disease issues. I first met you on the #hcsmca Twitter chat (no longer active). Are there any other chats you take part in? IJ: I loved #hcsmca while it lasted – that’s one of the things that really drew me into Twitter and led to a lot of wonderful connections. I also take part in #hcldr, but the timing is just terrible for those of us on the west coast. And I absolutely adore Liam Farrell’s #irishmed. I’m finding taking part in any of the tweet chats more and more difficult. It’s hard to make time and it always seems like they’re either at dinner time or when we have a medical appointment! What advice would you share with others who are just starting out with social media? IJ: It’s interesting – I’ve met quite a few people in person now that I first met on Twitter. And here’s the thing, for the most part, they’ve turned out to be pretty much the same in person as they are online. The people I choose to engage with, the people who get the authentic interactions are those that bring their real selves. So yes, talk about your professional lives, talk about your work, but bring in the other things that give you joy, entertainment, humour. Those are the things that make us human and relatable. And one more thing, recently I’ve come to realize that there seems to be a generational divide, those in my kids’ generation are pretty clear on understanding that the things they put on social media are permanent and potentially public, even if they are on private forums. I think that those that are in my generations (X) and those even younger than me could stand to learn that lesson. If you wouldn’t shout it while standing on a soapbox with others watching, you might want to think twice before posting it on social media. Super advice Isabel. It seems we still need reminding of this. I also really like your advice about bringing some personality and relatability to social media. We connect with each on a human level, even when that connection is digital. So, I like to end these interviews by asking for a favorite quote. Do you have one you’d like to share with us? I love that quote too and I’ve seen it play out enough in our communities to believe the infinite wisdom of those words. Thanks so much for taking the time to share your social media story with us, Isabel. I continue to be inspired and learn from you and highly recommend others do the same, particularly those who want to learn more about how to engage patients in equal partnership. Follow Isabel on Twitter @seastarbatita on Instagram seastarbatita_photography and check out her writings on her blog Modelling Change. This week it is my great pleasure to shine a social spotlight on Rod Ritchie. A 68-year-old, semi-retired, Australian print and web publisher, Rod uses social media to advocate for guys with breast cancer. His informative website MaleBC.org is a compilation of the latest diagnosis, treatment, and research on breast cancer in men. I first came across you through my own breast cancer advocacy work and you were keen to remind me that men get breast cancer too. While of course, I knew that to be a fact, male breast cancer is something that I’m less aware is spoken about on social media. How are you using social media to address this? RR: Social media is at the core of the work I do. Being a publisher and writer, with plenty of media experience, I find the mediums work well for those with the time and inclination to feed the hungry beasts. With breast cancer, men are not always in the conversation. Let’s face it, they are typically loath to seek medical attention and often to even talk to family and friends about medical issues. Research has proved that their later diagnosis leads to a poorer prognosis. But there are plenty of keen men and many amazing women, patients and medical professionals, who are willing to chime in, share information, and who are very supportive of guys dealing with this disease. I feel particularly privileged to be interacting with medical people and I really appreciate the professional way they share information, their humanity and concern for patients, and the insight they bring to the whole range of topics, particularly on Twitter. With social media you can be both proactive and reactive. I love that recognition that we are in this together – that social media can be a meeting point for health care professionals and patients. Can you tell me some more about how you are both proactive and reactive on social media in raising awareness of male breast cancer? RR: Not so much these days, but a few years ago, most mainstream breast cancer websites were gender specific to women. It was as if they hadn’t heard about men. Every time I saw a Twitter post not gender neutral, I’d react and publicly draw attention to the fact. Calling out gender blindness in breast cancer Tweets and Facebook blogs seems like a full-time job. I always think it’s a bit lazy of a writer to be neglectful or dismissive of the male perspective, since we go through equal hassles and tribulations during treatment, we have the same concerns about recurrence, and we feel more marginalized than is necessary. When I see a study or a trial posted on ClinicalTrials.gov, I check out whether men are invited to apply. Then ask, if not, why not. Lack of research on men and breast cancer is holding our understanding and treatment back. It’s also often useful to post a quote from a research article, along with the link, so that my credibility is seen to be linked to scientific research. It’s only by raising your integrity that a social media reputation is consolidated and followers gained. Correcting misinformation about male breast cancer and reporting on the latest research is most important to me. Since I completed my NBCC Project LEAD patient’s advocate course, I’ve been able to more critically examine scientific reports and technical papers. Where I see a useful study, I link it up on Twitter. I also keep a record of these trials and studies on my website MaleBC.org and my digital news magazine MaleBCReport and use social media to promote these outlets. Last month, we had Breast Cancer Awareness Month with all the attendant pink hoopla, which to my mind, reinforces the stereotype that breast cancer is a “woman’s disease”. How did you react to this? What did you do to counter-balance this gender stereotyping of breast cancer? RR: October is a big month. My aim is to have a few memes to spread around and to counter all the pink hoopla that inevitably spreads at this time of year. It always amazes me that breast cancer has become the shopper’s disease and that the seriousness, concern, and anxiety of living with the disease gets swept aside for a sort of celebration of how well managed this incurable disease has become. And while men rightly feel marginalized, I feel very distraught for my metastatic friends who have to endure all the crap that gets posted at this time of the year. I curate the Pinktober Revolution page on Breastcancer.org and have published a specialist site on the topic at PinktoberSucks.com. As a member of several Facebook breast cancer and prostate cancer patient pages, I’m supporting men (and women) who go there with questions about diagnosis and/or treatment. I’ve been amazed at the similarities between men discussing prostate cancer amongst themselves, and women discussing breast cancer. The men are very open talking about the myriad problems of prostate cancer including sexual side-effects. Just like women are when they talk about breast cancer. You really do work social media to the max Rod! Take us back a little in time to when you first discovered that social media could be a tool in your activist armor? RR: After finishing treatment for breast cancer four years ago, and deciding to spread the word that men get breast cancer too, I found my message falling on deaf ears in the mainstream media. Even the so-called “pink charities” were initially deaf to this inconvenient fact, and I discovered their websites were hardly acknowledging men, were very pink, and the institutional mindset was almost entirely women-centered. Alongside this, male breast cancer was an orphan disease, with a low profile and one that, upon diagnosis, left most men in a state of shock and more or less embarrassed to have a “woman’s disease”. Little discussed, even among men, it soon became clear to me that more could be done to promote awareness. I mean, women had long been aware of and encouraged to do breast screening and self-examination, but men, especially those with a family history of breast cancer, were unaware of their risks. And when they were diagnosed, they were loath to even use the words “breast cancer”. I even know of several men who told their friends they had chest cancer! I also discovered, that most men disappeared from view after initial treatment, and very often did not want to talk about their experiences to family, let alone in the public sphere. Even major public digital communities, such as Breastcancer.org with nearly 200,000 members, had very few men posting regularly when I turned to it for information four years ago. As in happens, I stayed with that community and now I’m the only man with the disease posting regularly there. Under the username Traveltext, I have made many cyber friends and feel very connected to members of forums such as Pinktober Revolution, IBC, and with the occasional man who comes to the almost moribund Male Breast Cancer boards. These are mostly young men worrying about breast lumps which almost always turn out to be cysts. I appeared in a video to support this charity. Where men could be reached, however, was in the relative anonymity of social media spaces such as Twitter and on closed Facebook pages. And coming from Australia, where annually only around 150 cases are diagnosed, I had the chance of connecting with some of the 2,500 men diagnosed each year in the United States, and those from the United Kingdom, where 380 guys are diagnosed annually. I work as the stories editor for the Kansas-based Male Breast Cancer Coalition and get to read what dozens of men have been through in the diagnosis and treatment of this disease. You’re a social media super-user – of all the social networks you use, which do you enjoy the most? RR: Twitter and Facebook in that order. All my interactions on Facebook are on closed groups because I don’t want my personal Facebook interactions to mingle with health communications since it is unnecessarily confusing and potentially distressing to friends and relatives to have the option of reading about all the matters that I bang on about. Facebook, without word limitations, allows people to discuss their issues, dispense advice, give treatment experiences, and generally cheer patients up. Some posts are a wealth of information, others are just chatty. But Twitter is no-frills, basic information sharing and is where medical professionals and patient advocates quickly exchange information, answer questions, and post links to sites that contain the full story. The rapid-fire nature of Tweets means it needs lots of attention, but you soon learn to scan and look out for people who regularly post interesting material and comments. Breast cancer is obviously your main focus. Do you take part in any breast-cancer related twitter chats? RR: I’m interested in all breast cancer topics, regardless of gender, since treatments for men and women pretty much identical using the same protocols which depend on patient’s staging and cancer type, etc. Notwithstanding this, I zero in on all discussions and research relating to breast cancer in men. I try to catch the weekly #bcsm Twitter chat, which runs for an hour from 8pm Monday EST in the United States. Because that’s 11am Tuesday where I live, it’s often not possible to tune in, but I’m certainly there when my favorite topics are up for discussion. RR: I’d suggest spending time getting to know the lie of the land with the topics you are following and the people who are consistently making the best posts. Post when you have something meaningful to say, not just for the sake of posting. Always be polite, and don’t become embroiled in dramas that arise from conversations outside your experience. Like comments that enlighten or interest you. Proof your text, since errors reduce your credibility and because you can’t alter posts, only delete them. I really like that advice, Rod. It reflects a measured and mature approach to engaging with social media that not everyone brings to the medium. Speaking of mature, I get so tired of the argument that social media is only for young people, — you clearly prove that this isn’t so. RR: I was in print publishing when the introduction of computers revolutionised the whole process, so I’ve been computer literate since the mid 1980s. As soon as the internet became a solid publishing format 20 years ago, I was there, applying my publishing and writing skills. At one time I owned over 100 web sites. So, age does not weary those of us techies who grow old! And since the average man gets breast cancer at 65, you’re unlikely to get many young guys with knowledge on this topic! I like to end these interviews by asking for a favorite quote. Do you have one you’d like to share with us? RR: Quotes are a big thing on social media, especially inspirational ones. But while I like many of them, and I certainly get their value, I feel, as patients, we are hard-wired to expect the worst from your disease and we sometimes need to pay more attention to medical professionals who have seen many hundreds of people in our situation. That advice has stood me in good stead as I realized that most of my fears were baseless and I really needed to get on with my life in remission, rather than obsess over what might or might not become a medical issue. Rod, that’s a wonderfully inspiring piece of wisdom for all of us to take on board. Thank you so much for taking the time to share with us your social media story. I enjoyed getting to know your work better and am in awe of all you do to raise awareness and support men with a diagnosis of breast cancer. This week it is my great pleasure to shine a social spotlight on Sue Robins. I first came across Sue through her eponymous blog suerobins.com and was captivated by her writing. Her thoughts and opinions on the role of story in medicine and how to affect meaningful patient engagement chime with my own and I’ve been hooked on her writing ever since. Sue is a New York Times published writer, speaker and mother of three. Her youngest son has Down syndrome. Her work experience over the past decade includes paid family leadership positions with Kinsight, BC Children’s Hospital and the Stollery Children’s Hospital. She is also the senior partner in Bird Communications, a health communications company in Vancouver & Edmonton. Sue self- declares herself a” rabble-rouser” and “health care big mouth”, which tells you quite a lot about who she is both on and offline. She is passionate (and outspoken) about family leadership, patient & family engagement, storytelling and nurturing compassion in health care, human services and education settings. Sue was diagnosed with breast cancer in February 2017 and has recently completed active treatment. This life experience grants her the unique perspective of being both a patient and caregiver in the health system. Sue, I really admire your outspokenness, which I know comes from a place of deep commitment to the ideals you believe in. I’ve been personally inspired by your writings on patient engagement and how we seem to have strayed from the true meaning of the term. Could you tell us some more about the role that social media plays in your activism? SR: I participate in patient and caregiver activism and Twitter is one of my tools. I deeply believe in storytelling, peer support, patient/family power and grassroots leadership in the worlds of health care and disability. I have a son with Down syndrome and worked as a paid family member at children’s hospitals for many years to bring the family voice into the health care environment. When I was diagnosed with breast cancer, I added patient advocacy to my basket. Sadly, in my formal positions, I was never allowed to have an ‘official’ Twitter account – corporate communications departments in hospitals hold onto that power very tightly. I consider myself a change agent and am always skirting around the edges with my own account, where I have autonomy and freedom to say what I want. I refuse to be muzzled. Now I’ve become deeply skeptical because of the professionalization of the ‘patient engagement’ movement. I often share articles that offer constructive criticism of engagement (#hownottodoptengagement) and highlight the need for humanity in health care. Twitter is my sharing mechanism. I’m a writer by profession and also use my account to post essays from my own blog, www.suerobins.com. I follow you on Twitter and you use it so effectively. Was joining Twitter when you first started to use social media? SR: I was an early adopter of Twitter. When I first moved to Vancouver, I met family and patient leaders through Twitter who became treasured friends and colleagues in real life, like @seastarbatita, @tatterededge, @karencopeland3 and @couragesings. I feel fortunate to have found these awesome women and we lift each other up every single day. We hear so many negative things about Twitter these days through mainstream media so I love that sense of lifting each other up. That’s been my experience too. Can you tell us some more about how you use Twitter in your work? I have two personalities on Twitter – my health and caregiver advocacy (@suerobinsyvr), my health communications company (@birdcomm). I use Twitter to curate my own news and I’m ashamed to say that while I used to get three print newspapers delivered to our home, my Twitter feed has replaced that. I try to follow a variety of accounts so I don’t just have the dreaded echo chamber – where I only read news that validates my own (admittedly left-wing, environmentalist) views. Do you use other social media networks aside from Twitter? SR: I enjoy Instagram. I deactivated my Facebook account years ago. It reminded me too much of high school and I had grave concerns about how Facebook shared people’s information. I have three accounts on Instagram. I have a guilty pleasure of scrolling through photos of wedding dresses, as my daughter is getting married next summer. I do carve off my different personas into three accounts. One is my private family account and the other two are public – @healthsquawk, my rabble-rousing where I post about healing from breast cancer and @foodiesuz, which is a fun account where I post pictures of eating out. My advocacy work tends to be heavy and often times dark, so it is important to have a joyful interest – food is that for me. I like that sense of balancing the heavier work-side of Sue with the fun side. You have a lot of different things going on in your life, so which topics particularly hold your interest? Do you take part in any regular health-related twitter chats? SR: My topics change depending on what’s up in my life. When I was deep in treatment for breast cancer, I was obsessed with following #BCSM and folks like @ninariggs, @cultperfectmoms and @adamslisa. I miss the wisdom of all three of these powerful women. Now that I’m in what I call cancer healing mode, I do follow those who talk about the gritty reality of breast cancer, including the life of our sisters with metastatic breast cancer, like @the_Underbelly and #breastcancerrealitycheck. You’ve mentioned some great accounts to follow on Twitter which is so helpful for newbies starting out. Thinking back to my own first forays into Twitter, it can be quite overwhelming. What advice would you share with others who are coming to social media for the first time? SR: I’d suggest thinking about why you are on social media. Being clear about your intention is important with any aspect of your life. Is it to follow news? Share articles? Engage in conversation or debate? I think it is okay to take a break. I took a Twitter break for nine months earlier this year. I had tipped into spending too much time looking at my stupid phone and I wanted to put my head up and be more present in ‘real life,’ especially with my son. Those notifications are addictive and I had lost balance. I also had experienced harassment from (white, privileged) men. Now I put my phone in the bedroom when I get home and limit my social media time to early mornings, which feels healthier to me. That’s valuable advice for all of us Sue, whether we’re new or seasoned social media users! That quote could be written for you! Thank you so much Sue for taking the time to share with us your social media story. I’ve picked up some tips and reminders about maintaining balance through listening to you. Wishing you continued success in the work you do. This week I am thrilled to kick off the social spotlight interview series again with one of my favourite people – Jo Taylor. Founder of After Breast Cancer Diagnosis, Jo is a straight-talking Northerner and a force of nature. A fearless patient advocate and campaigner living with secondary breast cancer, she inspires me every day with her energy and passion. Jo, I am in awe of the work you do. I know you have several projects on the go, so can you tell us a little about some that are close to your heart right now? JT: Currently I’m working on my #abcdretreat . I held 3 this year and the plan is to get sustainable funding that can support 5 residential a year and other additional ones but not redirecting. I want to be able to franchise the model as people have now asked my advice in replicating. I know it works and I can inject the right ideas and know how into producing them in different areas. A lady from the last retreat wants the franchise in the Isle of Wight! I’ve also had interest from America and Canada. Social media reaches the places others can’t. It’s unbelievable how it’s grown in the last 2 years. I did a pilot 2 years ago with 9 breast cancer people. I now know how it works best and people gain so much out of it! There’s lots of ideas but can’t say too much at the moment. A business plan is in the process and there are two other grant funds that again I can’t talk about that I’ve applied for. Only time will tell if these things work out. Fingers crossed. I’m also involved in the #busylivingwithmets campaign that started last month in Breast Cancer Awareness Month. While metastatic breast cancer is terminal and cannot be cured, because of improved treatments more women are living longer than ever with it. Even so, many misconceptions and lack of information about this diagnosis persist. A stranger called Elizabeth Richards contacted me and like many other women she knew very little about MBC, yet the more she found out, the more angry and amazed she became that the illness was side-lined. Elizabeth’s view was that as long as metastatic cancer wasn’t mainstream people would not be aware of the limited treatment options available to them. If they knew, they’d demand more. NICE, NHS, charities there’s so much not happening and it should be. Secondary breast cancer patients need a real voice to push policy and make changes – patients need early diagnosis of mets, better treatments and surgeries. If the government really want the life expectancy to improve and the U.K. world cancer ranking to improve from 17th position, these are the things that are needed to make this happen. I also am the founder of METUPUK who are looking at the aims and objectives detailed in the graphic below, and we’re committed to turning metastatic (secondary) breast cancer into a chronic disease instead of a terminal disease. I’m also involved in steering groups for Experimental Cancer Medicine Centre (ECMC) in Greater Manchester and in the Greater Manchester User Involvement programme working in partnership with clinical groups and boards like the Greater Manchester Breast Pathway Board which I attend as Secondary Breast Cancer patient representative. I truly am in awe of all that you do Jo! So, tell us what role social media plays in all of this work. How did you get started with social media? JT: All these things use social media to push their profile. I was on Twitter with my own personal account and wanted to see how Twitter worked and how I could use it after creating my website After Breast Cancer Diagnosis – I spent a good year or so researching and understanding how it worked to be able to replicate this with my @abcdiagnosis Twitter account. I didn’t want to just take followers over from a personal account. Many did follow me from my personal account but it grew from there to what it is today. Which platform(s) do you enjoy using the most? JT: I use Twitter as my main platform. I have a Facebook page as well which I then expand on the information from Twitter as FB is wordier. I don’t link one media to the other as I feel it doesn’t work for me. I don’t use Instagram as I don’t feel this is a worthwhile medium for abcd. I find it unrealistic and more of a “celebrity” medium that just isn’t what I want to promote. Life isn’t all about the perfect photo and I am a real person not a posed and promoted one. I also feel this is damaging to people and our children. I don’t feel my “brand” is right on that medium. I ask all my guests the following question – but I probably should know the answer to the next question already. Which topics interest you – eg do you take part in any particular twitter chats? JT: Any topics to do with breast cancer, secondary BC, patient involvement, advocacy interest me. I’m also massively interested in exercise with and after cancer so get involved in things to do with these subjects. I want to make a difference for other patients and people living with and beyond cancer. Exercise is something we can all do and at very little cost so I like to motivate people to do this. I have a closed FB group for people who have been on the retreats and it’s great for them to keep motivated. We also have WhatsApp groups that keep them motivated and connected. JT: Connecting with people and actually chat with them! This is the one thing people don’t always do, they think they will just get followers by no interaction, I’ve seen it. You have to be part of the conversation, don’t be shy, talk, get involved, do Twitter chats, lurk until you feel comfortable in speaking but we all have an opinion and that’s the thing, we don’t have to agree. Don’t feel silly to stick your head above the parapet and have an opinion. Be kind – many people have cancer and sometimes things can be taken incorrectly too (Maybe my Northernness?!) I’ve been on the receiving end and sometimes easy to be misunderstood. Don’t feel silly to say I’m sorry I didn’t mean it that way also, I still can say something and the meaning isn’t taken in the right context. If something happens DM someone and there’s been times I’ve apologised or smoothed things over. Interaction is everything though, it’s just like speaking to someone face to face. Remember don’t say something to someone you wouldn’t face to face. There are real people behind these accounts (most of the time). Block anyone who is continually rude or upsetting. I’ve only had to block three people ever in the last 6 years and most of the time I’ve had only a good experience of social media. I love that advice Jo, and I agree that is easy for misunderstandings to arise online. I appreciate that you care enough to smooth things over. It’s important that we build and nurture those online relationships we value too. So, finally, would you like to share a favourite quote with us? Favourite quote – too many to choose from but this resonates – no, exercise won’t cure clinical depression but whatever disease or problem, it certainly can make you feel a whole lot better if you try it. That’s a powerful note to end on Jo, and as healthcare communicators, we both understand the value of a visual to get a key point across! 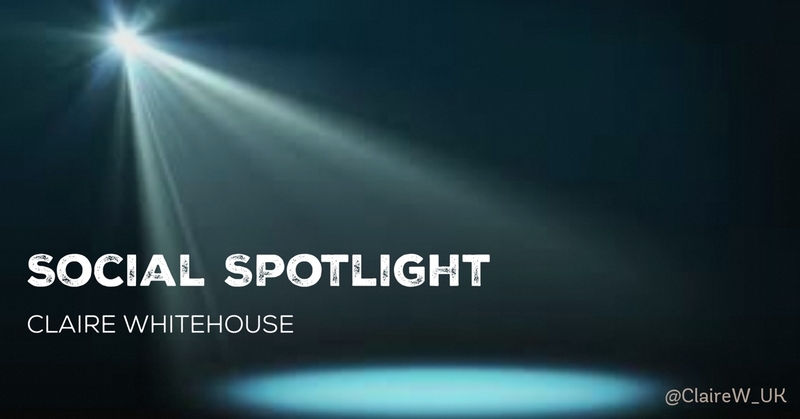 This week I am delighted to kick off the social spotlight interview series again with Claire Whitehouse, lead nurse for research at The James Paget University Hospitals NHS Foundation Trust and founder of the #WhyWeDoResearch global campaign. I love the #WhyWeDoResearch campaign. Can you tell us some more about how it started? CW: In 2014 I decided to introduce my team to our local population using twitter as our social media platform. I tweeted using our Research and Development handle @JPUHResearch and having explored the use of twitter for a few months prior to this, I had identified that photographs received the most attention, retweets and ‘favourites’. To introduce our team I decided to release one photo, name and job title per day along-with the individual holding a placard upon which they had written the reason why they personally are involved in research. There was born #WhyWeDoResearch. I had intended this would be for the 12 days of Christmas as a Christmas campaign. Within four days Michael Keeling (@keeling_michael ‏) of York Teaching Hospitals NHS Trust had picked up on it and from there it became a National campaign, at which point it was extended throughout the Christmas period. By the new year it had reached Canada and Australia and became known globally. Now, two years later it is in 23 countries globally, with >15,000 separate accounts participating and >250 MILLION impressions on the hashtag. I lead the campaign entirely voluntarily and there are other individuals who support this lead eg Hazel Smith who is based in Dublin. I am also involved in the Health and Research through Social Media (HARTSofthepossible) project which aims to drive health research through and using social media. I really love how you have created these grass-roots campaigns. How did you first get started using social media professionally? CW: I focus on twitter as it’s so easy to use and has an extremely large reach. The @wenurses team have a fantastic tool called twitterversity which helps people get started. That’s fantastic! I can probably guess the answer to this next question, but do tell us more about which topics interest you on Twitter? Do you take part in any particular twitter chats? CW: Regular twitter chats are hosted using #whywedoresearch – the topics vary depending on who volunteers or what conversations are happening at the time, this is the beauty of twitter, you can create live chats and people will always be interested. In 2016 we hosted the worlds first research tweetfest in May to coincide with International Clinical Trials Day. We can’t claim entire credit as an idea as it grew (as most things do) from a small idea. I tweeted (from my bed) one Saturday morning 2 weeks before ICTD and asked #whywedoresearch followers if they would like a tweetchat on ICTD. By that afternoon I had 11 individuals offering to host chats and within 48 hours we had set up over 20 chats and coined the phrase #tweetfest. The 2017 tweetfest is over 2 weeks from Monday 15th May and there are 31 chats to choose from. CW: Don’t be scared. Embrace it and go for it. Thanks Claire for taking the time to share with us your experience of using social media in your work. I look forward to seeing your campaigns grow and prosper over the coming months. This week it was my great pleasure to catch up with fellow Irish man and global citizen, Brian Dolan. A director of Health Service 360, Brian has a career that spans more than 30 years working as a nurse and nursing leader with a background in both acute mental health and emergency nursing. Hi Brian, I am keen to learn more about the role social media plays in your work. Has it led to any exciting projects? BD: For some years now I’ve been talking about the last 1,000 days – the time left if you’re an 80-year-old woman whose life expectancy is 83 years or 76-year-old man whose life expectancy is 79 years – and why patient time is the most important currency in healthcare. In July my blog on this topic was published by @FabNHSStuff and curated by the wonderful @PeteGordon68 and @ECISTNetwork. It seems to have taken on a life of its own through twitter, LinkedIn and Facebook and will now the subject of my next book, ‘The Last 1,000 Days’. Thank you social media! That’s really exciting Brian! So when did you start using social media. What prompted you to get started? BD: I started using Facebook 7-8 years ago mainly for staying in touch with family and friends, as I work and live in New Zealand and the UK, as well as having extensive travel to Australia. With cousins in California it means I can chat with loved ones up to 19 time zones away! I think that’s certainly true of many of us – we are led into social media for personal reasons, but then we discover a whole other side to it. Professionally, which platform do you enjoy using the most? BD: While Facebook has been wonderful for reconnecting with friends and family from childhood and beyond, I really enjoy Twitter as the single best source of Continuing Professional Development I’ve known in my career. I also love that you can create personal connections with so many eclectic, interesting and generous folk – like yourself Marie! – whom one might not otherwise meet. I agree! Meeting like-minded people has been one of the most rewarding aspects of social media for me too. Which topics interest you? Do you take part in any particular twitter chats? BD: While unsurprisingly nursing is my main interest, quality and service improvement, all things Irish and PhD research are also places I live on twitter. Time zone constraints mean I don’t get to enjoy as many twitter chats as I would like but I like to catch up via their hashtags. BD: Twitter is not just about Kardashians and the waters of healthcare Twitter are warm, kind and generous, so jump right in. Always be your best self on social media and don’t be tempted to feed the trolls! Great advice! Finally, would you like to share a favourite quote with us? No matter how educated, talented, rich or cool you believe you are, how you treat people tells everything. Integrity is everything. Thanks so much Brian for taking the time to share with us your experience of using social media in your work. It’s been a pleasure to get to know you better through this interview and I look forward to hearing more about your new book when it’s published.